Home > Tech Insights > What Makes a Great Promethean Grant Submission? The November 1st deadline for the Promethean Grant is approaching fast. Don’t miss your chance to win a free ActivPanel for your classroom. 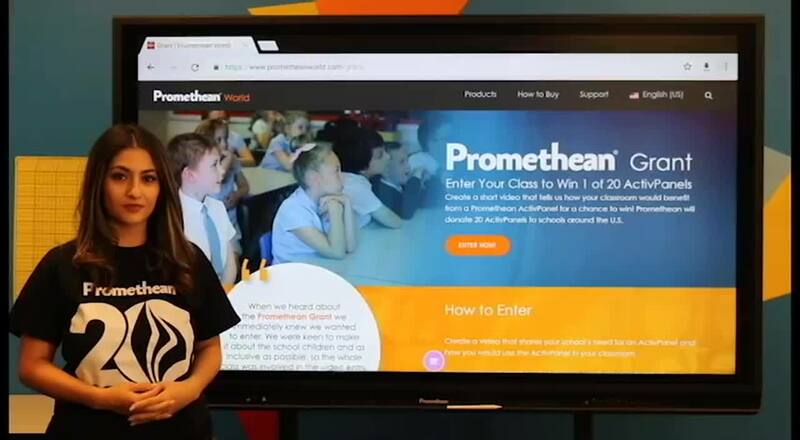 To enter, submit a video and explain why you need a Promethean board in your classroom and the impact it will make on your students. There are 20 ActivPanels available, so be sure to be creative to stand out from all the other submissions. Interested in submitting, but haven’t created a video yet? Below are the top three questions that you should ask yourself and incorporate in your video. 1. Why Do You Need an ActivPanel? The question seems fairly straightforward, but we understand that sometimes nerves might be getting the best of you. Out of all of the technology that you can get for your classroom, why do you want an ActivPanel? Make sure that you or your students state that reason in your video. 2. What Impact Will the ActivPanel Have on Your Students? At Promethean, we believe that the purpose of classroom technology is not to automate the teaching or learning process. Instead, we believe that its purpose is to inspire and empower every student in the classroom. Let us know how your students will benefit from having an ActivPanel in the classroom. 3. Is Your Video Creative? We’ve been receiving a number of different submissions. To ensure that your video stands out from the rest, make sure that it’s creative. Pulling together a creative video doesn’t mean that you need professional video editing skills. Instead, we want you to find out-of-the-box ways to tell us your story. Whether it’s including your students in the film or updating the lyrics to your favorite song, make sure your video is creative! Incorporate all three questions into your submission, and you’ll be one step closer to winning an ActivPanel for your classroom. Remember, the deadline for submissions is November 1, 2018. For more information about the Promethean Grant, visit www.prometheanworld.com/grant.